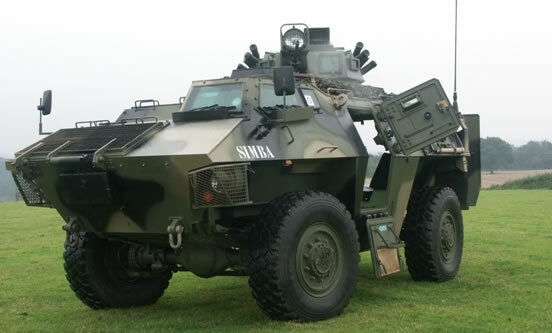 The British 4×4 Simba Armoured Personnel Carrier can transport 8 to 10 troops in the main compartment, which is located behind the front section of the vehicle were the driver and engine is located. It can accommodate various turrets which is mounted centrally and accessed from the main compartment. Developed for the export market (ie it wasn’t for the British Army) by former British Firm GKN Defence (now part of BAE Systems), its only customer and operator is the Philippines Armed Forces, who were supplied with 150, of which x2 were delivered complete, x2 in self assembly kits and the rest manufactured under licence in the Philippines. Mortar – Turret replaced with large hatch so that a 81mm mortar can be fired from with in the vehicle. The mortar is mounted on a turntable so that mortar can be bared on to different targets with out the vehicle having to move.